We are pleased to announce the release of a new version of the Yamaha Steinberg USB driver for Windows and Mac. The main addition to the new update, version 1.10.2, is the support for the brand-new Yamaha MODX synthesizers. However, it also resolves an issue on Windows that kept popping up. Please find the updated version 1.9.10 here. Thanks for the new driver but this driver still having the problem with UR44. Also PA audio issue (no sounds for a while on general PA like Youtube, Audio player (non-asio) still exists. Last edited by Archost on Fri Sep 28, 2018 8:31 am, edited 1 time in total. The driver still has the same issue with dropouts with my UR22 MK1, I would say its a little bit less frequent but at the moment its hard to tell for certain. Not solved problem of audio dropouts on my brand new PC, brand new Steinberg Cubase Artist, brand new Halion 3 and brand new Steinberg UR22. Issues every step of the way. I had the 1.10.1 version installed and working. Then i tried to install 1.10.2 and now I can't revert back. It always stuck and gives me the 25005 error. Any idea how to fix it? * I'm not using any hubs for the UR824. * I am running the setup as an Admin. * Tried changing USB ports, no luck. Windows recognises the UR824 it but can't find any drivers for it. Hey man, is all of this really necessary to get the error code gone? 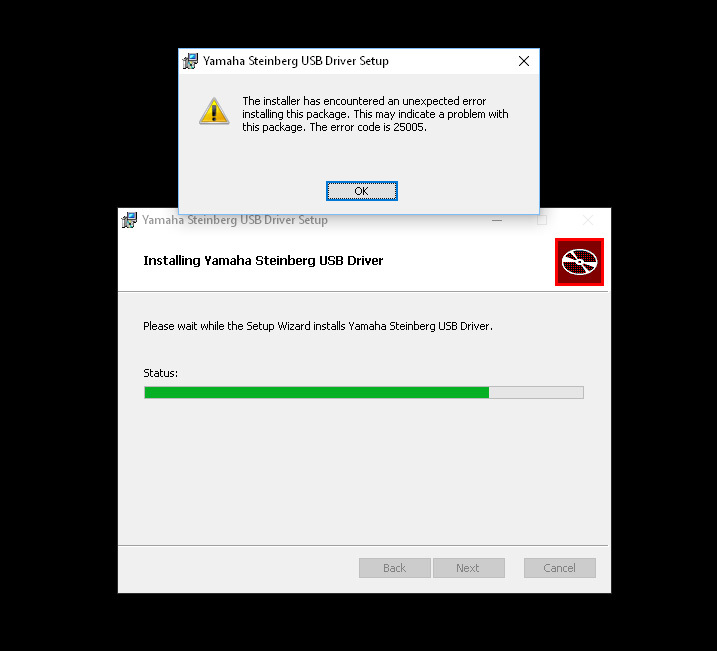 I have a computer my brother gave me and its never had a version of Yamaha USB Drivers on it ever...yet I still get the ERROR 25005. Could you tell me A) Why this error is even coming up and B) If theres an easier solution as I am nervous about doing what you said to do. Thanks in advance for the help.